As expected, Google has finally announced the details of its wireless smartphone service that will, at least at first, piggyback on the networks of Sprint and T-Mobile. 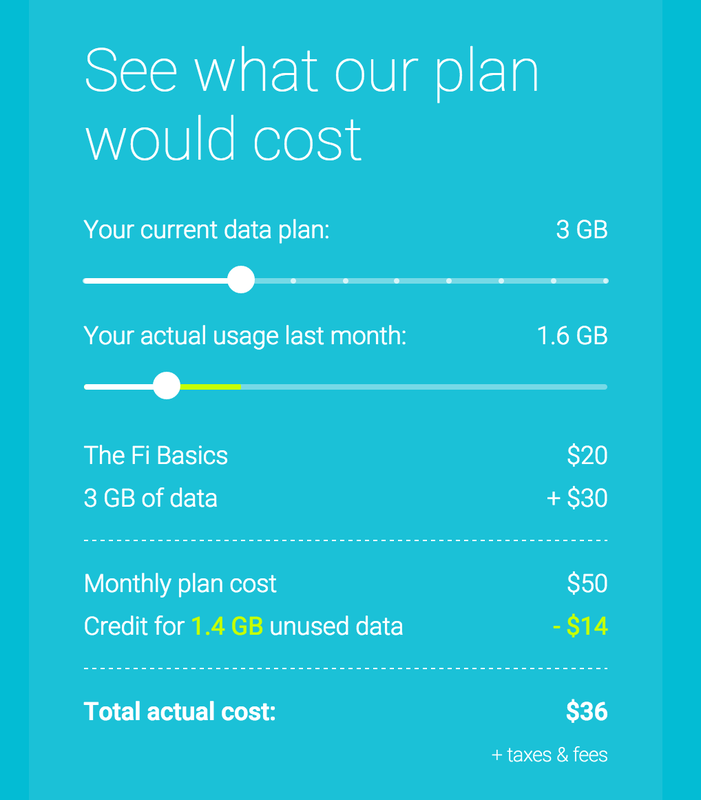 It’s called Project Fi and plans with unlimited talk/text, unlimited international texting, and WiFi tethering will start at $30/month, with each gigabyte of data you use costing an additional $10. And if you don’t use your full allotment, your account gets credited accordingly. Google has details of the plans available here. In terms of pricing, there is currently only one base tier for phone/text, and that’s $20/month. Each gigabyte of data costs $10/month. So the lowest cost plan is $30/month (phone/texting + 1GB of data). A 2GB/month plan would cost you $40, and so on in increments of $10. But if you don’t use the full amount of data for a month, your account gets credited. While Google is using existing wireless networks from Sprint and T-Mobile for Fi, it says the system will constantly be searching for the optimal connection, which may sometimes be a WiFi hotspot. So the idea is that Fi will switch between the two to minimize the amount of data being used over the cellular networks and to provide you the fastest available connection at any given time. Of course, until we see it in action, we have no idea how seamlessly these transitions will work or if the use of WiFi will result in significant changes to wireless data use. Right now, Fi is an invite-only service and you’ll need to have a Google Nexus 6 device. To request an invite, first go to this site to see if your area is covered, and then go here to actually request the invite.